It’s Kelly Cercone’s Star Wars dresses you’ve been snapping up over at Hot Topic from the Her Universe competition. 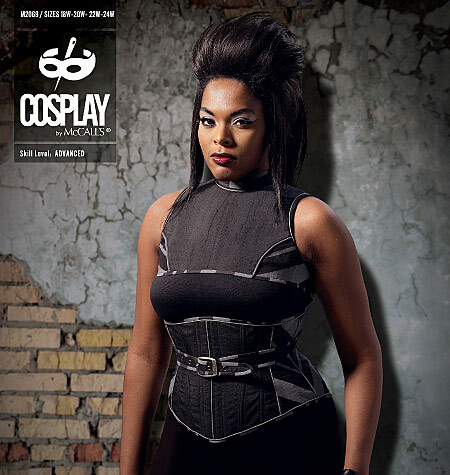 Kelly, by way of Anachronism in Action, is the designer of this advanced skill level plus-sized corset, M2069 Renegade. In two size ranges, RR 18W-24W, and KK 26W-32W, this pattern is meant for the under-served plus size woman. It’s billed as a halter top, underbust corset and belt, but it’s better described as a halter, underbust corset and curved belt. The halter is somewhat similar to the idea of a neck corset, in that it is worn at the neck, covers the neck and top of the rib cage—and a little more in this case—but is shaped like a princess-seamed top. It is boned with spiral steel at the back bottom edge. It does not, however, function as a top as it does not cover the bust. It is purely decorative. Hence, not a halter top. The corset is in ten panels, moderately curvy, without busk, and has a modesty panel. There are clear instructions on how to bone the corset, and it even shows how to bone the modesty panel—a definite must, especially in the plus sizes. Bunny-ear lacing is illustrated, though it’s better to do it in one piece to avoid the knot at the bottom, which looks messy. The curved belt, which you may worry would stretch out of shape because it is, by nature, cut on the bias, is supported by binding, and gains stability from this. The whole thing—all three pieces—laces up the back, with the belt lacing into the halter. You unbuckle the belt, and unlace the top bit of the halter to pull it on and off over the head, so pretty much once you make considerations for hair and makeup, once you are in, you are in for the duration. The line art on the envelope—at least on my copy—shows the belt worn at the bust which, for various reasons of geometry, will not work. The line art on the website and inside the envelope are correct. As confirmed by Kelly Cercone, you can adjust where the belt rides by way of how much slack you leave in the lacing, but it will not work at the bust. Go by the photos. They are correct. The tutorial for this pattern is for coutil, the fabric of choice for corsets, and the use of reflective piping and tape. The tips are concise, but detailed enough to be useful. Our cunning model, finding she is desirous of the pirate life, has freed herself from the confines of her laces and has come broadsides to board M2079 Bow and Brine, by Anna He of Seattle Cosplay. There she dons a sweet little button-front pirate-inspired shirt. She peers into your soul from under her tricorn, and commands you to sew a few for yourself. This simple shirt by is a take on the staple off-the-shoulder peasant blouse, but with bust and waist darts controlling the fullness. If you like peasant blouses, but do not like the volume of fabric that that style carries with it, this is the pattern for you. Three sleeve options and three detachable neck options offer a variety of looks, so you can use this pattern again and again, or just swap out neck treatments to match whatever you are wearing while plying the seas that day. There are two size ranges, YY SML8-MED14, and ZZ LRG16-XXL26, so everyone is covered. Find a similar belt to stitch up over on M2051 Intrepid, or perhaps M2050 Belle Noir. The tutorial on this pattern envelope is all about the types and uses of ribbons and lace—information that suddenly makes some of the intimidating parts about sewing a whole lot easier, and far less daunting. Lace is so much your most forgiving friend.